Amos Joseph Otis (born April 26, 1947) is a former center fielder in Major League Baseball who played for the New York Mets (1967, 1969), Kansas City Royals (1970–1983) and Pittsburgh Pirates (1984). He batted and threw right-handed. Otis was initially drafted by the Boston Red Sox in 1965 as a shortstop. However, he spent time in the outfield, third base, and first base while playing in the minors. In November 1966, the Mets drafted him and he jumped all the way to Class AAA in 1967. He saw some time with the Mets late in the 1967 season, but he spent 1968 at AAA again before making the major league roster in 1969. When the Braves asked for Otis when trying to trade Joe Torre, the Mets refused and Torre wound up going to the St. Louis Cardinals instead. Otis immediately clashed with Mets manager Gil Hodges, who tried to make him a third baseman. After four games, Otis was sent back to the minors for a month. At the end of the season, Royals general manager Cedric Tallis sent third baseman Joe Foy to the Mets, in exchange for the young Otis. Foy was bogged down by drug problems and was out of baseball by 1971. Meanwhile, the Royals immediately moved Otis to center field, and he became the starter for most of the 1970s. He made the American League all-star team each of his first four years with the team and he won three Gold Gloves. His speed worked well with the Royals' team philosophy of speed and defense. On September 7, 1971, he became the first player since 1927 to steal five bases in one game. He led the American League with 52 stolen bases that year. Otis scored the final run ever at Kansas City's Municipal Stadium in the fifth inning on October 4, 1972. He hit as many as 26 homers in a season, knocked in 90 runs or more three times, twice led the AL in doubles and once in stolen bases with 52. He compiled a career total of 341 steals, while being caught stealing 93 times. Otis was a clutch performer, and he consistently produced for the Royals as the team became a perennial contender. On September 12, 1977, Otis helped eight youths who were stranded after a Royals game had been rained out when flooding prevented the boys' parents picking them up. "If it was my kids", Otis said, "I would have wanted someone to do something for them, too." Otis hit .478 with three home runs and seven runs batted in the 1980 World Series. He set a record for putouts in a game by an outfielder in Game 3, a contest in which he also homered. He is one of two players (along with Alex Bregman; 2017) to drive in a run in each of his first five World Series games. Later his offense began to decline, in part due to a hand injury. By the late 1970s and early 1980s his fielding skills had diminished, and he lost his center field job to Willie Wilson near the end of his long run with the Royals. 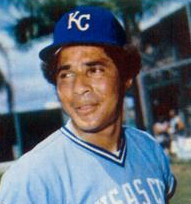 In 1983, he left the team before the season ended when told he was not in the Royals' future plans. He spent most of 1984 in the National League with the Pittsburgh Pirates. It was a quiet end to a successful career. In a 17-season career, Otis posted a .277 batting average, with 193 home runs and 1,007 RBI in 1,998 games while stealing 341 bases. He worked for the San Diego Padres and Colorado Rockies as a hitting instructor, and he has retired to Las Vegas. Otis still attends Royals reunions, and he dons a uniform to play in alumni games. In the early 1990s Otis admitted that he used a corked bat during part of his Major League career. ^ a b c Neyer, Rob (2006). Rob Neyer's Big Book of Baseball Blunders. New York City: Fireside. ISBN 0-7432-8491-7. ^ "Otis Confesses Use of Corked Bats to Help Hit .277 as Major Leaguer". Articles.LaTimes.com. April 28, 1992. Retrieved 8 June 2012. This page was last edited on 12 December 2018, at 05:02 (UTC).